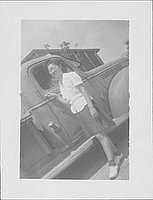 Full-length portrait of a young woman in eyeglasses, white blouse and short dark skirt standing in front of a truck holding onto passenger side door handle at Rohwer concentration camp, Rohwer, Arkansas, 1942-1945. 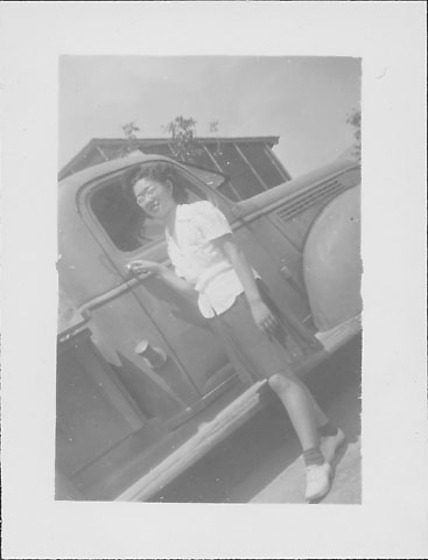 Image is angled so that her feet are at the BRC and her head is nearly in TL. Top of barracks partially visible above truck. Appears to be the same woman in 97.292.6L, 6M, 6P, 6T, 6U, 6AM.